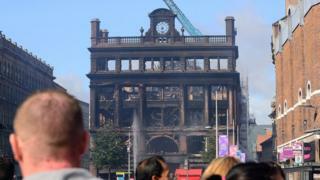 Shopper footfall in NI is up overall - but the impact of the Primark fire has continued to affect numbers in Belfast. Latest data for October reveals a 60% decline in the city's footfall compared to the same month in 2017. The figures come as a bid to attract shoppers back to the city centre is to be boosted by £1.1m from Stormont. The cash announced by head of the civil service David Sterling means the council now has £6m to spend on promoting the city centre. The money, coming from Stormont, includes £500,000 for Translink "to deliver a high-impact festive travel campaign". It will involve offering £2 fares and midnight services. Glyn Roberts, of trade group Retail NI, welcomed the extra money but said it was not enough..
"This a huge undertaking and will take a lot more than £6m," he said. Belfast's retail troubles contrast to a 2.7% uplift in Northern Ireland overall. "Some areas of Northern Ireland are doing better because of the displacement factor," said Aodhán Connolly of the NI Retail Consortium. Based on figures, the situation is deteriorating dramatically month-to-month. For September, Belfast footfall was recorded as being down 30% year-on-year. "These will be worrying figures for those businesses that are around what is being dubbed the cordon quarter," Mr Connolly said. "With Christmas only weeks away it is imperative that shoppers come back to the city centre in their droves to ensure the survival of these traders." Statistics are compiled nationally by the analysis firm Springboard. Meanwhile an Ulster Bank survey has suggested the broader retail sector saw a slight fall in business activity in October. The bank surveys private sector activity monthly, in what is considered a reliable indicator of the economy. The latest survey suggested the manufacturing and broader services sector grew, while construction and retail saw a contraction. Business confidence dropped to its lowest level in almost two years. The bank's chief economist Richard Ramsey said the "mounting pessimism" in the latest survey largely relates to the construction sector. "The lack of decision-making in government in Northern Ireland and the resulting logjam in capital projects is now being acutely felt by many construction businesses." The manufacturing sector remains a bright spot with continuing "strong demand, despite a slowdown in export orders", he added.